New Chelsea Manager Guus Hiddink has confirmed he would like the club’s Ivorian legend Didier Drogba to return to Stamford Bridge as his assistant. 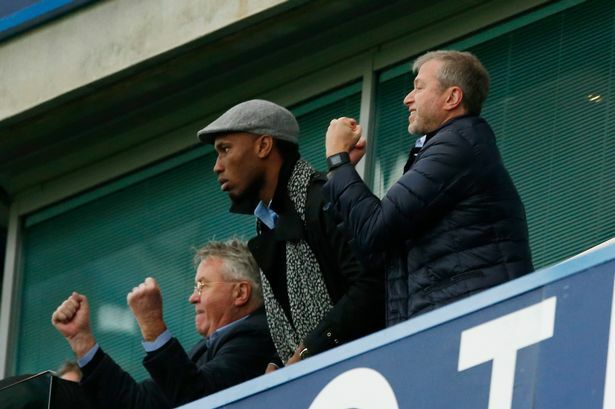 Drogba, who joined Canadian club Montreal Impact in the MLS during the summer after the expiration of his contract at Stamford Bridge, watched Chelsea’s 3-1 home win over Sam Allardyce’s Sunderland alongside Hiddink and club owner Roman Abramovich on Saturday. Speaking on a possible Drogba return, Hiddink said: “We would like to get him involved. But he still has a contract with Montreal in the MLS, even though it is the close season for them. Drogba with 104 Premier League goals in two separate spells is regarded as a cult hero at Chelsea after winning major titles including the UEFA Champions League, 4 Premier League titles, 3 Capital One Cup titles, 4 FA Cup titles and 2 FA Community Shields.